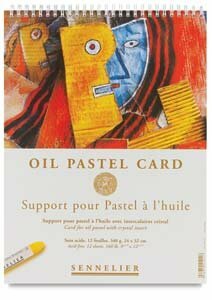 Sennelier Oil Pastel Pad 15.75x23.5"
Sennelier is the original inventor of oil pastels, and their expertise has produced this must have pad for any oil pastelist. It is designed specifically for direct application of oil pastels so that they don't seep, bleed through or halo on the paper. Machine-made bright white, acid-free heavyweight textured paper. Features protective interleaved glassine sheets, top side spiral binding, popular large sizes, and contemporary cover graphics that match the Sennelier line. If you have any questions about this product by Sennelier, contact us by completing and submitting the form below. If you are looking for a specif part number, please include it with your message.